The winter 2013 Craft and Hobby Association Show has come on gone...for Spellbinders it was an amazing show. I heard other people saying the show traffic was down. I had no idea. We were mobbed throughout the entire show...our new releases and the new Media Mixage line of products for mixed media art are amazing, and our results at the show proved it. Winter CHA was just incredible! As I am digging my way out from under the piles of orders and following up on all the opportunities coming out of the show, I realized that one of the most exciting things I got to do during the show, was to appear on Create and Craft TV with Spellbinders Director of Education Kim Hupke. I didn't know this, but Create and Craft TV is a big deal...it goes to something like 26 million homes worldwide...and more if you count the internet...I had no idea when I said, "Sure, sounds like fun." Now, Kim is a pro at this, she's been on QVC, HSN, PBS, and Create and Craft countless times over her long career with Spellbinders, she's a natural! Me? Not so much. I'll say "yes" to just about anything...so, it was a little daunting to walk into the Create and Craft TV Studio on location in Anaheim, to see the enormous cameras and booms overhead. But it was all GOOD...and extremely fun. Kim really put me at ease...she said "just show them what you love to do and let your personality shine through." Her kind words of advice really helped me conquer that little twinge of "stage fright" I was experiencing. Anyway, it was the chance to share doing what I love to do with a much bigger audience...why wouldn't that be fun? We got to share lots of cool Spellbinders die cutting techniques, sanding on foil techniques and got to demonstrate using Royal & Langnickel Engraving Art Board. It gives a really dramatic effect when used with Spellbinders dies and new 3D Mbossability folders. 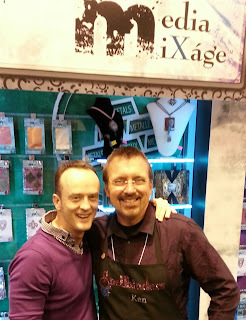 And, I got to meet and work with Nigel May. 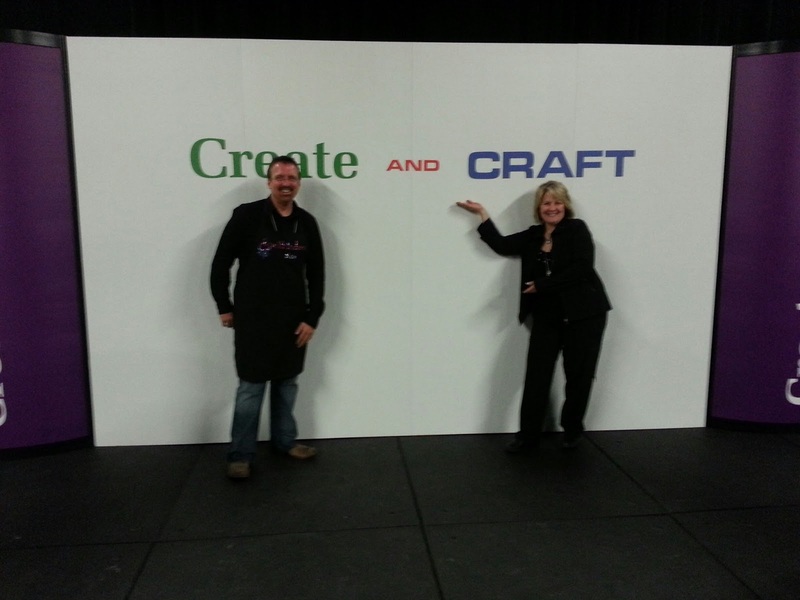 He's is a powerhouse of crafty inspiration! After the show, I met up with the cast and crew at Downtown Disney...we shared quite a few laughs...it was really nice to make some new friends from across the pond, who I hope I'll have the pleasure of seeing again someday. They were all so nice. 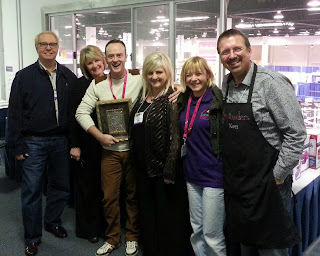 Here's a pic taken in the Create and Craft TV Green Room with Nigel May, Leonie and the Spellbinders team...it was really fun to work with such an awesome crew. Did I mention we had sellout, "record" hours on the show? Our newest releases were so popular that we sold out almost as quickly as we demonstrated each die and folder! I was really happy that our on air results were so good! 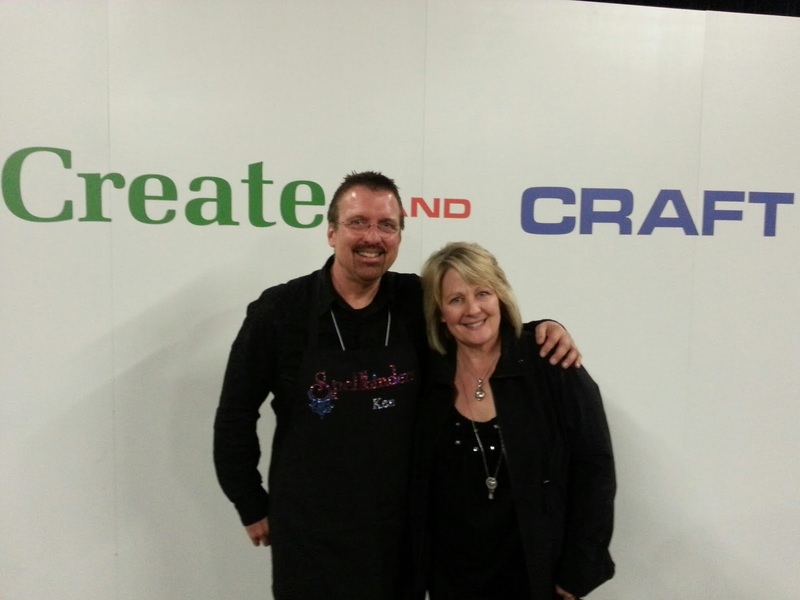 This year's CHA was simply amazing...and appearing on Create and Craft TV was the highlight of the show for me. It was a real pleasure to share Spellbinders with the audience in the U.K.
Now, if you know me, you know I don't sit still for long. 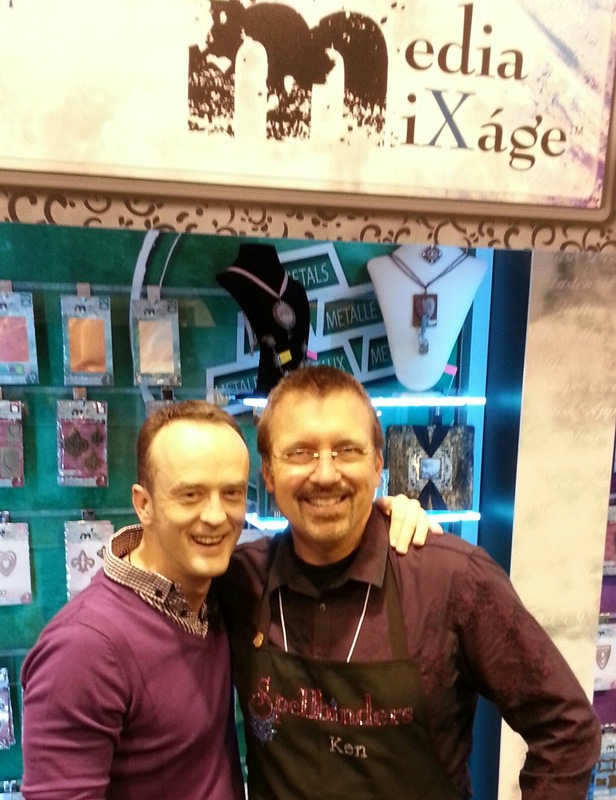 This week, after a quick trip to Michigan for Media Mixage training, I'll be headed to Germany later in the week for the Paper World Show in Frankfurt. I am really looking forward to this next adventure! Wow! 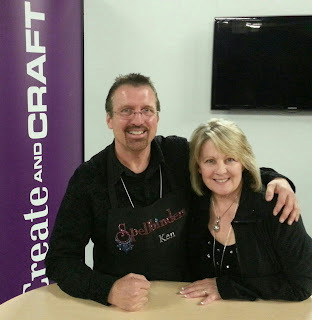 Ken, things are really shaking and moving for you at Spellbinders! It sounds like life is exciting. Have a great trip to Germany!